We’d love your help. Let us know what’s wrong with this preview of Margaret and the Moon by Dean Robbins. Soon math led her to MIT and then to helping NASA put a man on the moon! She handwrote code that would allow the spacecraft’s computer to solve any problem Margaret Hamilton loved numbers as a young girl. She knew how many miles it was to the moon (and how many back). She loved studying algebra and geometry and calculus and using math to solve problems in the outside world. To ask other readers questions about Margaret and the Moon, please sign up. Oh, if only there had been books like this when I was a kid. How wonderful to let little kids see that girls can do anything, even write code that would save the Apollo mission to the moon. One reviewer complained that it didn't give enough information, and it was too short, but it is a picture book meant for the very young, and this is all they need. Very colorful illustrations by Lucy Knisley, artist known for her foodie cartoons, and of late, for her cartoons about her toddler son, code name P Oh, if only there had been books like this when I was a kid. How wonderful to let little kids see that girls can do anything, even write code that would save the Apollo mission to the moon. Very colorful illustrations by Lucy Knisley, artist known for her foodie cartoons, and of late, for her cartoons about her toddler son, code name Palindrome. Here's to female scientists and children's picture books about them! I loved MARGARET AND THE MOON about the woman who is considered the first female software engineer. This is a must-read for strong girls and those who love and support them. I wish the format had permitted the inclusion of a little more information about her life, but overall this is a very good short biography of the woman who invented the term "software engineer" and who wrote the computer code for the Apollo program. Much of the bibliography is material written for adults, far above the level of this book, but at least the information is there. The visuals, a mixture of illustrations and photographs, is both informative and interesting. I thought that the visual pr I wish the format had permitted the inclusion of a little more information about her life, but overall this is a very good short biography of the woman who invented the term "software engineer" and who wrote the computer code for the Apollo program. 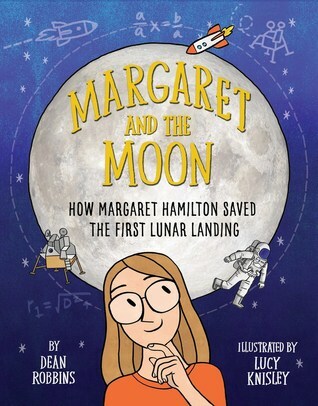 The subtitle of this book is “How Margaret Hamilton Saved The First Lunar Landing,” and it introduces readers to Margaret Hamilton, “who loved to solve problems” and “came up with ideas no one had ever thought of before.” Eventually she became a part of the American space program at NASA. Most famously, she helped The subtitle of this book is “How Margaret Hamilton Saved The First Lunar Landing,” and it introduces readers to Margaret Hamilton, “who loved to solve problems” and “came up with ideas no one had ever thought of before.” Eventually she became a part of the American space program at NASA. And she did, programming computers to do things they had never done before. In 1960, Margaret took an interim position at MIT to develop software for predicting weather. She later observed that at that time, computer science and software engineering were not yet disciplines; instead, programmers learned on the job with hands-on experience. From 1961 to 1963, she worked on a project writing software for military use in anti-aircraft air defense. This work led to her being chosen as Director of the Software Engineering Division of the MIT Instrumentation Laboratory, which developed on-board flight software for the Apollo space program. After her work with NASA, she went on to found her own companies for systems design and software development. You may recognize the work of illustrator Lucy Knisley from her adult graphic novels such as Relish: My Life In The Kitchen.. She employs cartoon-style illustrations - a perfect choice to convey the excitement of Margaret’s discoveries, and a variety of texts to punctuate the narration. At the back of the book, there is an Author’s Note, a bibliography, and a list of recommendations for additional reading. Evaluation: Both Robbins and Knisley are to be credited with making what could have been a dry story into more of an inspiring and entertaining comic book tale of a real-life superhero. This is amazing!! Why did I not learn about Margaret Hamilton in school? Why is she ignored in the landing Apollo 11, when she saved the day?! Such an important book. Give this to everyone! Read for Info Books for Youth for grad school. Cool story about a cool lady in history! Love the illustrations, too! Can't decide if I think the font is super fun or if it just makes it harder to read. Great book about a woman whose contributions to making it possible for Neil Armstrong to land on the moon have gone unsung for a long time. I love the illustrations and the playful way her story is told. Another fine addition to the growing number of illustrated informational picture books. Margaret Hamilton has always been an unconventional thinker. As a computer software engineer, she wrote codes to tell computers to track planes, predict the weather, and fly astronaut Neil Armstrong in Apollo 11 to the moon for NASA. The book reminds every parent and teacher of the importance to encourage children to use their imagination and curiosity to solve problems in unusual ways. This is a great children's biography about Margaret Hamilton and how she wrote the code for the Apollo 11 lunar landing. The story is crisply told and the illustrations are bright and engaging. This picture book biography passed the preschooler test - my two-year-old made me read it twice in a row, exclaiming over the pictures: "She playing music! She painting! Wow, mooooon!" This does a great job of highlighting the accomplishments of a true trailblazer. Notes on representation: Hamilton was white; people of other skin colors are depicted in crowd scenes and in Margaret's imagination. 1/28/2018 ~~ Hmmm. Great concept, interesting illustrations and layout. I'll order for my library. HOWEVER, I wish the story told a bit more about the context Hamilton worked in: education, barriers faced, people she interacted with. The book feels like she worked in a vacuum. I want my girls to know more about college, advanced degrees, etc. This nonfiction picture book tells the story of Margaret Hamilton and her work on computers. When Margaret was a girl in the 1930s and 1940s, she wondered why girls weren’t studying science and math, so she did. She went to MIT and started working on computers back when they required handwriting code and the computers filled entire rooms. She eventually went to NASA where she programmed computers to help astronauts travel to the moon and connect to one another in space. When Apollo 11 came and a This nonfiction picture book tells the story of Margaret Hamilton and her work on computers. When Margaret was a girl in the 1930s and 1940s, she wondered why girls weren’t studying science and math, so she did. She went to MIT and started working on computers back when they required handwriting code and the computers filled entire rooms. She eventually went to NASA where she programmed computers to help astronauts travel to the moon and connect to one another in space. When Apollo 11 came and astronauts were going to land on the moon, Margaret wrote the programs to get them there and back safely. In fact, when disaster struck it was Margaret’s programming that kept everyone safe and accomplished the goal. Robbins writes with a celebratory tone in this biographical picture book. His appreciation for Margaret’s ability to ask tough questions and figure out answers is clear. Throughout, he keeps the tone playful and light, showing the hard work behind the accomplishments, and her inquisitive nature as the keys to her success. It is great to see graphic novelist Knisley illustrating children’s books. Her illustrations match the tone of Robbins’ writing, keeping the entire book light and celebratory. The amount of work done by Margaret is staggering and is shown by Margaret next to a pile of papers that showed the length of her code. That same image is repeated as a photograph at the end of the book. I just did a long Instagram post waxing lyrical about this book so it feels a little repetitive but here it is anyway. My little guy (Codename: Moongazer) is besotted with the moon an stars. It's not through anything we did. He just one day saw this big shiny thing in the sky (and many little shiny things too) and once we gave him the words for it (he was only 15 months at the time), it was like his whole world expanded. It's filled us adults with renewed wonder at universe too which is pretty c I just did a long Instagram post waxing lyrical about this book so it feels a little repetitive but here it is anyway. I'm intrigued by the Author's Note at the end, as some of the information in it seems repetitive, or *could* have appeared in the story; it's as if the author (or publisher) didn't trust in his own excellent storytelling skills. In all, big fan of this book as a mom, a writer, and a teacher. I can imagine using it in a biography or narrative nonfiction study in writing workshop; it might also be paired with books like Rosie Revere, Engineer and Ada Twist, Scientist or even The Most Magnificent Thing and placed on display in classroom near math and science activity centers. I'm interested in seeing other texts by Dean Robbins now too. Margaret Hamilton’s contribution to NASA and the space program is a footnote in history. This book should go far in correcting that and shining a light on the opportunities open to women in mathematics and science. A curious child, Margaret loved working math problems. When an adult, she began to write computer code as a software engineer. She was hired by NASA and became Director of Software Programming for Project Apollo. When a glitch happened as Apollo 11 was landing on the moon, she had prep Margaret Hamilton’s contribution to NASA and the space program is a footnote in history. This book should go far in correcting that and shining a light on the opportunities open to women in mathematics and science. A curious child, Margaret loved working math problems. When an adult, she began to write computer code as a software engineer. She was hired by NASA and became Director of Software Programming for Project Apollo. When a glitch happened as Apollo 11 was landing on the moon, she had prepared and written code to avert the problem. An author’s note in the back offers more information about Hamilton, a bibliography of largely adult materials, and a short bib of “Additional Reading” appropriate for boys and girls. Written with a light touch, Lucy Knisely’s cartoonish illustrations are well paired. Her first children’s book, it is full of color and emotion, figures and fun. Margaret and the Moon is a nonfiction picture book about Margaret Hamilton, a young girl who loves mathematics and applies her fascination to learning how to write code for computers. Eventually, she goes to work for NASA where her coding skills are important to the Apollo program. When the Apollo 11 lunar module develops a last-minute programming glitch, everyone turns to Margaret. Fortunately, Margaret had anticipated the possibility of this exact problem and easily solves it with her coding s Margaret and the Moon is a nonfiction picture book about Margaret Hamilton, a young girl who loves mathematics and applies her fascination to learning how to write code for computers. Eventually, she goes to work for NASA where her coding skills are important to the Apollo program. When the Apollo 11 lunar module develops a last-minute programming glitch, everyone turns to Margaret. Fortunately, Margaret had anticipated the possibility of this exact problem and easily solves it with her coding skills. Dean Robbins tells Margaret story with a light touch. The mathematics is shown as fun, and the drama of the Apollo program is basically presented as more math fun. Lucy Knisley’s comic-style pictures contribute to the light touch, but they also provide more in-depth representations of some of the math for those who look a little deeper. In a time when coding is becoming an integral part of the standard curriculum, an appealing story featuring code can be a worthwhile addition to a home, library, or classroom collection. ANYWAY I am fascinated by what Ms Hamilton did more than how she looks. My father and I spent a long time yesterday talking about his trip to see the remnants of the Apollo spaceship in an observatory in Pittsburgh and without the lady in this book's help, NASA's space program might have had far more difficulty getting off the ground. It says (view spoiler)["She helped Apollo 8 orbit the moon ten times. She helped Apollo 9 connect two ships in space. She helped Apollo 10 get within nine miles of the moon's surface." (With the famous shout out from the shuttle of "Hello there!") (hide spoiler)] It goes on with what happens with Apollo 11 but you might want to actually read it yourself to see what it says in full colour! Margaret Hamilton was the first scientist to call herself a software engineer. Her important contributions to space travel, especially the Apollo 11 mission, are recounted for the youngest readers in this engaging picture book biography. Short declarative sentences and bright, simple illustrations give readers a picture of girl who was always curious to know more about her world, and was determined to find out the answers herself. From MIT to NASA to software companies, Hamilton forged her own Margaret Hamilton was the first scientist to call herself a software engineer. Her important contributions to space travel, especially the Apollo 11 mission, are recounted for the youngest readers in this engaging picture book biography. Short declarative sentences and bright, simple illustrations give readers a picture of girl who was always curious to know more about her world, and was determined to find out the answers herself. From MIT to NASA to software companies, Hamilton forged her own way. This is an important person for kids to know about, especially kids who are interested in space travel. Back matter includes biographical information, a bibliography and additional sources. Back endpapers show black and white photograph of Hamilton. For ages 5-9. This would be a great read-aloud for kindergarten and first grade classes. Robbins, Dean Margaret and the Moon: How Margaret Hamilton saved the first lunar landing, illustrated by Lucy Knisley. PICTURE BOOK. Knopf (Random), 2017. $18. Margaret’s head was full of questions and a yearning to learn, especially about the workings of the universe and space. When she discovered computers, she taught herself to code and went to work for NASA. Her coding skills were key to most of the Apollo missions and especially to the safe landing of Apollo 11. Robbins’s picture book is a pe Robbins, Dean Margaret and the Moon: How Margaret Hamilton saved the first lunar landing, illustrated by Lucy Knisley. PICTURE BOOK. Knopf (Random), 2017. $18. Robbins’s picture book is a perfect combination of text and picture for a dynamic read aloud for elementary students. It shows the not her growth in her field, but the important programming work she did on the Apollo missions. Very well done picture book biography of scientist and mathematician Margaret Hamilton. Margaret invented the term 'software engineer" to describe her job. Margaret worked for NASA and played important roles in the planning for the Lunar landings as well as serving in leadership roles. Robbins does an excellent job of giving young readers an understanding of her roles as a computer scientist. Lucy Knisley's illustrations are so appealing and fun. I really loved this inspiring story and am so happ Very well done picture book biography of scientist and mathematician Margaret Hamilton. Margaret invented the term 'software engineer" to describe her job. Margaret worked for NASA and played important roles in the planning for the Lunar landings as well as serving in leadership roles. Robbins does an excellent job of giving young readers an understanding of her roles as a computer scientist. Lucy Knisley's illustrations are so appealing and fun. I really loved this inspiring story and am so happy to have more books about scientists and especially women scientists being added. During the last 38 years Dean has been a consistent innovative, successful performer by sharing his progressive motivational skills through seminars, lectures and coaching. He has proven himself as an experienced, seasoned, energetic speaker, leader, coach, consultant and real estate trainer throughout the years to tens of thousands of people of all ages, ethnic groups and social economic backgrou During the last 38 years Dean has been a consistent innovative, successful performer by sharing his progressive motivational skills through seminars, lectures and coaching. He has proven himself as an experienced, seasoned, energetic speaker, leader, coach, consultant and real estate trainer throughout the years to tens of thousands of people of all ages, ethnic groups and social economic backgrounds. Dean aggressively employs new methods to build self- confidence, attitude, image and skills. Dean is a person of education, experience, action and results; let his creative concepts help guide you towards a new beginning in your life today. He and his wife Susan currently live in Puerto Vallarta, Mexico. He has been active in real estate sales, management and consulting, holding training seminars, writing and publishing motivational books.